Let’s take a look at five of our Top Ten Fast and Easy Thanksgiving Dessert Recipes. If you’re short on time this Thanksgiving, lack inspiration and dessert ideas, or need a quick last minute dessert idea for Thanksgiving (or Christmas), these are the “go to” recipes we LOVE. Plus, these aren’t you’re standard pumpkin pie types of desserts. These Thanksgiving dessert recipes are not only quick and easy – they’re UNIQUE. That means you’ll be the fun one at your holiday get-together and you’ll be the crowd-pleaser! There’s also a SUPER simple (and really unique) Peanut Butter Cookie Dough Thanksgiving Dessert Dip recipe here. It’s not only pretty to look at, it is flat-out addictingly delicious! OK, Let’s look at 5 more super simple, easy-peasy, unique and fun Thanksgiving desserts. 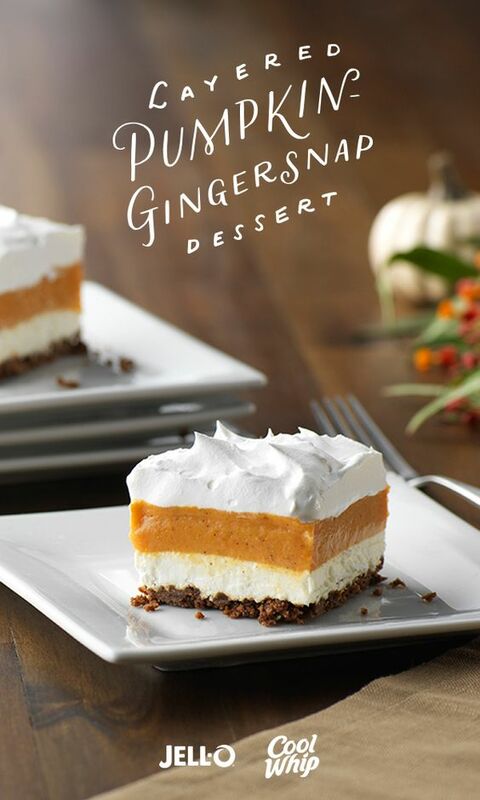 Our friends at Kraft have this delicious and super easy Thanksgiving dessert idea. A tasty blend of vanilla pudding and pumpkin is layered with creamy whipped topping over a gingersnap cookie crust in this easy, yet elegant, dessert. Get started with JELL-O Vanilla Flavor Instant Pudding, COOL WHIP Whipped Topping, cream cheese, gingersnaps and a can of pumpkin. 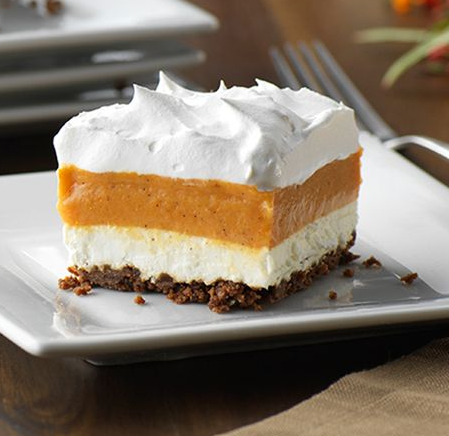 Wow everyone this Thanksgiving with Layered Pumpkin-Gingersnap Dessert! 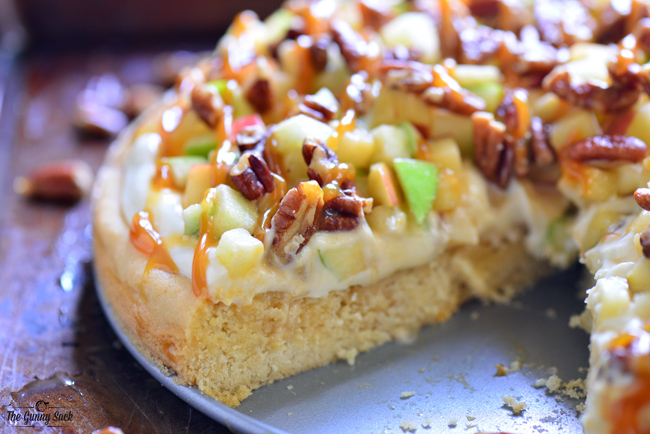 Take a look at this yummy caramel apple fruit pie – now THAT’S a unique Thanksgiving dessert idea, right? TheGunnySack has the full recipe here or see it on Pinterest here. What’s faster and easier than a DUMP CAKE?!?! 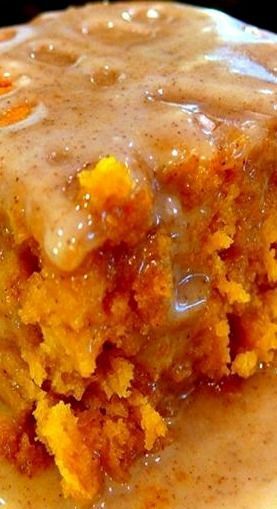 This pumpkin dump cake has about 10 minutes of prep time and is super easy to make. Perfect idea for a last minute dessert when you’re rushed for time and inspiration. See it on Pinterest here. You might need to look at this Top 10 Christmas Toys list first! Want a unique Thanksgiving dessert idea that’s even easier and faster than a dump cake? How about a TWO INGREDIENT Thanksgiving dessert idea? Seriously, just a can of pumpkin puree and a box of yellow cake mix is all it takes to make this Thanksgiving dessert.